Harry J. Holzer from The Brookings Institution outlines a proven process for Creating skilled workers and higher-wage jobs. "Many US employers now choose “low road” human resource models, where they seek to profit only by minimizing labor costs, rather than investing in skilled employees who would be more productive and committed to their businesses (the “higher road” to competitiveness and profitability). But they could make other choices. Interestingly, when German manufacturers open plants in the US (where they enjoy lower energy costs and greater access to our consumer markets), they create more apprenticeships and other worker training programs than their American counterparts." Such manufacturing companies have usually set their own employment standards and paid for the training required to teach the prospective employee. The public financing of higher education was adopted post WWII, in such programs as the GI Bill. Rebuilding Europe and Japan put into motion the retraining education where one objective was to transfer the knowledge for practical job careers. The education explosion of degree mills in disciplines that have little to do with the real world has left a glut of untrained and underachievers. The Hechinger Report asks, Are apprenticeships the new on-ramp to good jobs? "The traditional high school-to-college-to-employment route has hit a number of potholes recently, among them cripplingly high college tuition and growing concern that higher education is disconnected from emerging work opportunities. Although demand for jobs requiring bachelor’s degrees is rising at twice the rate of those requiring only high school diplomas, there’s a growing sense among some companies, including Zurich, that baccalaureates aren’t necessarily the best way for students to gather meaningful job skills and experience." This is an obvious conclusion. 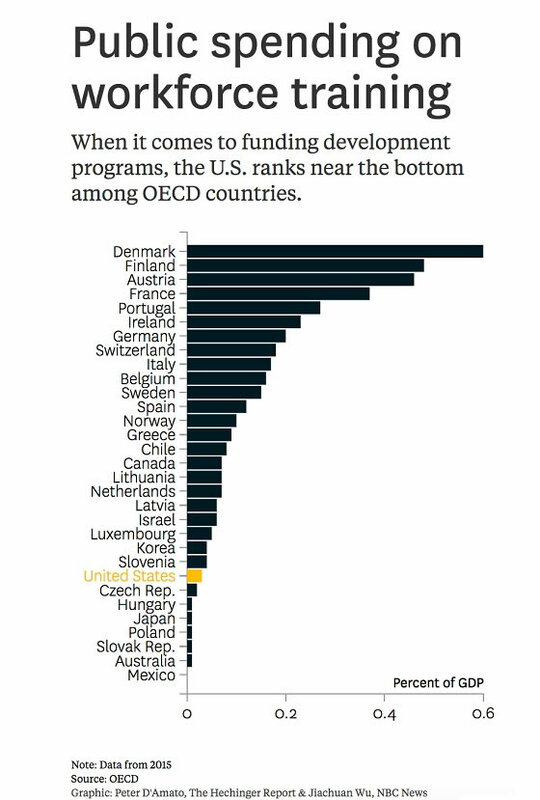 Those beholden to the government dependency society will view with alarm that public spending for workforce training is relatively low when compared to the European socialist states. However, who still believes that a college degree is so desirable when the burden of paying for such highly overrated matriculation is so poorly rewarded in the job market? Companies who want to build a sound organization understand that developing the proficiency of their employees is one of their greatest assets. Since the benefit of apprenticeship programs mostly are reaped by corporations, the primary responsibility for funding should fall on their organizations. Nonetheless, the coordination and support for such endeavors can be advanced through the United States Department of Labor, as defined by How does apprenticeship fit into career pathways? "Apprenticeship programs are a key asset for state and local workforce systems’ career pathway strategies. Apprenticeship can be a partner in the K-12 educational system and an integral part of career and technical programs in high schools. School or community-sponsored pre-apprenticeship programs can be valuable training approaches and serve as the start of a career pathway, which leads to Registered Apprenticeship opportunities for youth or low-skilled adult workers. Apprenticeship programs pave the way for career-building and life-long learning through the attainment of stackable credentials. The foundation of the apprenticeship model is the continual building of skills and the ability for workers to obtain higher levels of employment in an occupation or industry. As a result, use of the apprenticeship model can provide communities with a competitive advantage by establishing a continual pipeline of qualified workers for local employers." Workers want to earn a living wage. Employers want stable, competent and efficient employees. When the formal academic institutions fail in the crucial mission of preparing their pupils for the hardened circumstances of the work environment, they cheat not only their students, but also companies. Snowflakes do not last long when the heat turns up to engender results on the job. What all these trades have in common is that apprentices are required to work hard. In an economy this attribute is seldom discussed much less taught in school. Learning this know-how will gain a living wage pay check. Nevertheless teaching such common sense in classes that emphasize computer encoding avoids the economic consequences of artificial intelligence which is designed to replace the programmer with an autonomous system of unconstrained code generating machines. As the collectivist economy stamps down gainful employment options, succeeding generations will struggle even harder to eke out a marginal living. Few people have the courage and dedication to become proprietors of their self-owned businesses. Most entrepreneurs do not succeed. Workers with meaningful skills; however, have a marketable future. If society revamped their delusion about what it takes to actually earn a living, introducing extensive apprenticeship schooling would be a profound improvement over the wasted subjects taught within the education system. When interest rates rise to their historic levels, finding a decent job may well become even more difficult. Skill-less is an unimpressive qualification on a resume. Learning a useful craft does not mean basket weaving. No one will pay you a living wage when you cannot produce a meaningful benefit.